Underparts are golden-chestnut with dark markings. Vent and undertail coverts are dark chestnut. 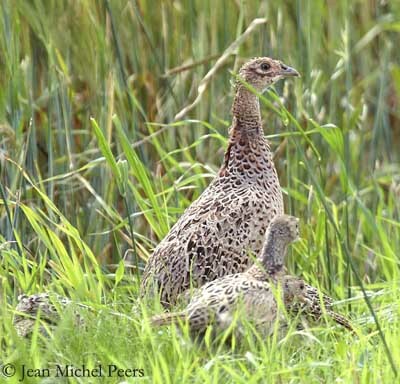 "Les auteurs renoncent à leurs droits d'auteurs pour que la vente de cet ouvrage, publié par la World Pheasant Association, soit destinée à soutenir des projets de conservation." Head and neck are deep green with dark blue iridescences. A greenish-grey glossy patch covers the top of the head, tapering to a point on the nape. We can see a white collar around the neck. Face shows red facial wattles and green tufted “ears”. The strong bill is whitish. Eyes are golden. Legs and feet are dark grey. Phasianus colchicus torquatus, coming from eastern Chine. Phasianus colchicus colchicus, coming from Transcaucasia and east and southeast of Black Sea. And a great diversity of typical and dusky forms (melanistic). Melanistic forms are the result of bred with the green Phasianus versicolor from Japan. 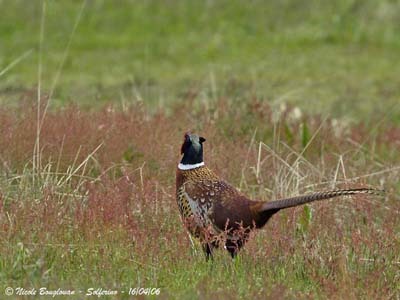 Common Pheasant male gives a crowing advertising call, a harsh, scraping “ko-KOK”, with head pointed upwards. It may perform at the same time a brief whir of wings in spring. 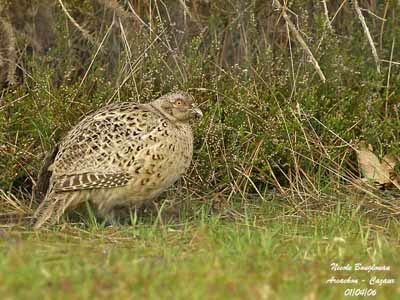 Common Pheasant frequents farmlands, open lands with shrubby cover, woodland edges, open woodlands, from lowlands to mountain foothills. 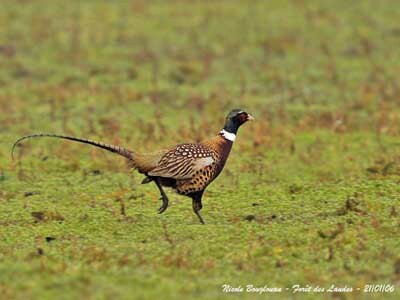 Common Pheasant is native to India, Southeast Asia and China. Species have been introduced elsewhere, and they are bred to be hunted in great numbers. 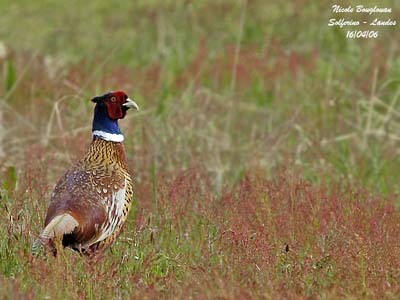 Common Pheasant is a game bird in all parts of the world where it is living. This species is resident in its range. 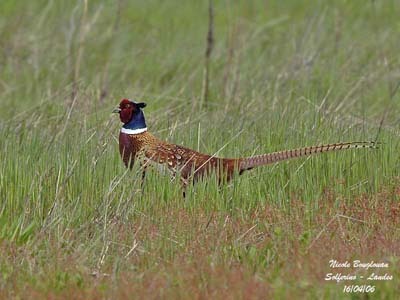 In its native areas, Common Pheasant lives in open forests or meadows. But this opportunistic bird feeding on various seeds, fruits and insects is now well adapted to other habitats, such as cultivated areas. Male is polygamous. 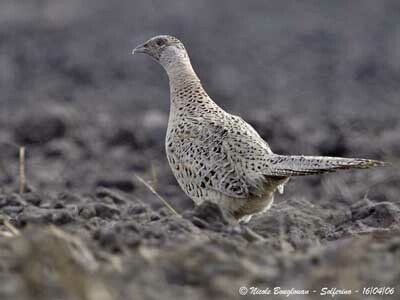 Its beautiful plumage attracts the females, and it may have up to 18 in one harem. Females feed with the territorial male for up to six weeks, in order to build up fat reserves for nesting. Male is vigilant over females, protecting then from predators and other males. 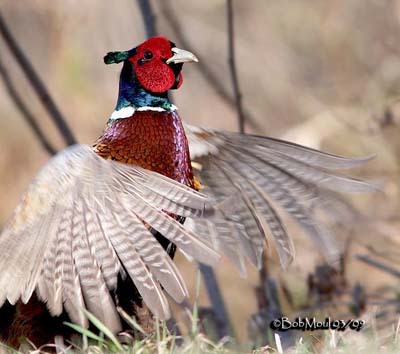 During courtship displays, male runs around each female with near wing trailing on the ground, twisting over its tail, and inflating its facial wattles in order to expose its finery. Once females start to incubate, male ignores them. 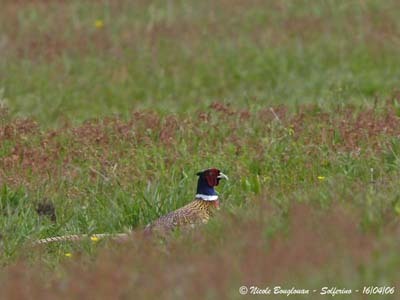 But its colours attract the predators too, such as foxes and stoats, whereas female and young are protected by their dull plumage. 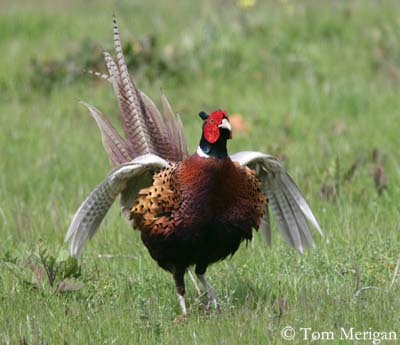 If it is alarmed, Common Pheasant prefers to run rather to fly from danger. It roosts in trees at night. 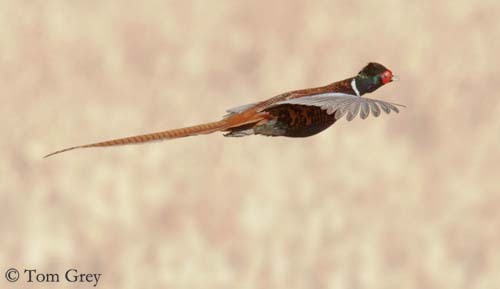 Common Pheasant can fly swiftly, but it is not able to sustain the flight over long distances. 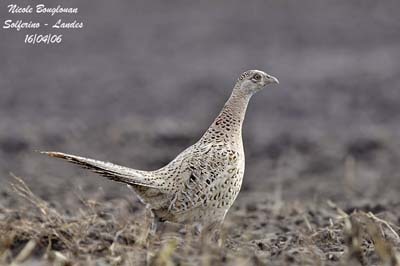 This species has short rounded wings and long pointed tails, very conspicuous in flight. The take-off is noisy. 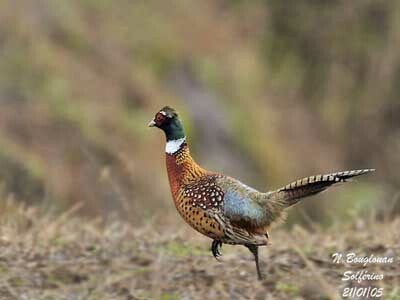 Their flight speed is 43 to 60 km/h, but they can fly up to 95 km/h when chased. The nesting period occurs from March to August, with a peak in April-June. 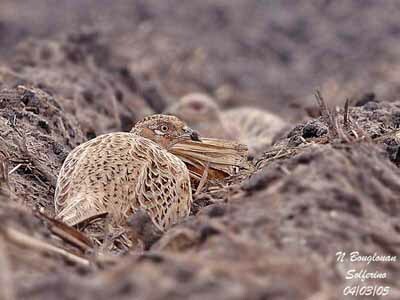 Common Pheasant’s nest is a shallow scratched-out depression of twigs, grass and rootlets. It is lined with grass or leaves, and usually well hidden into vegetation, giving it domed appearance. Female lays about 8 to 14 olive-brown eggs. 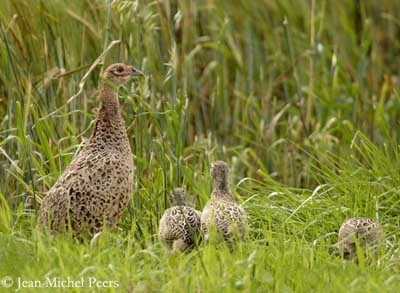 Incubation lasts about 22 to 25 days, by female alone. Chicks are precocial, and leave the nest immediately. They are able to perform short flights at 12 to 14 days of age, but they are dependent on insect food in the first two weeks after hatching. They fledge at about 8 to 11 weeks. This species produces one brood per season. 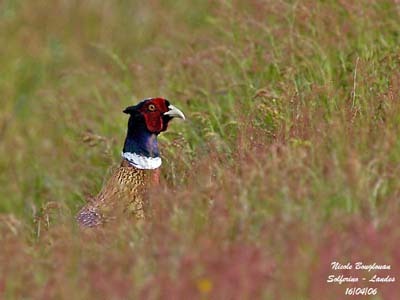 Common Pheasant feeds on cereal grains, seeds, buds, leaves, fruits and some invertebrates. 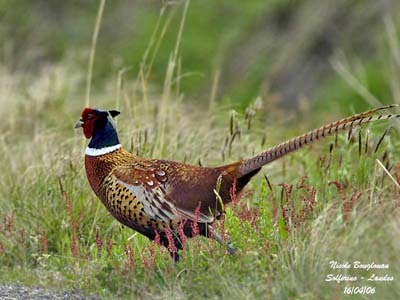 Common Pheasant is the most widespread and common pheasant in the world. Millions of birds are reared each year in Europe and North America for release in sport hunting. It may be common or very abundant in many parts where it has been introduced. 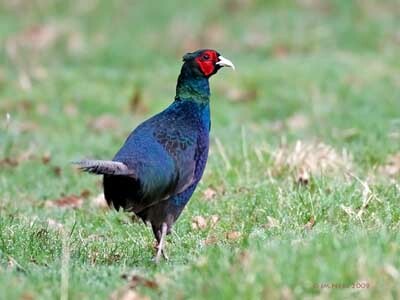 However, at least 15 species of pheasants are endangered and threatened by both overhunting and habitat loss.